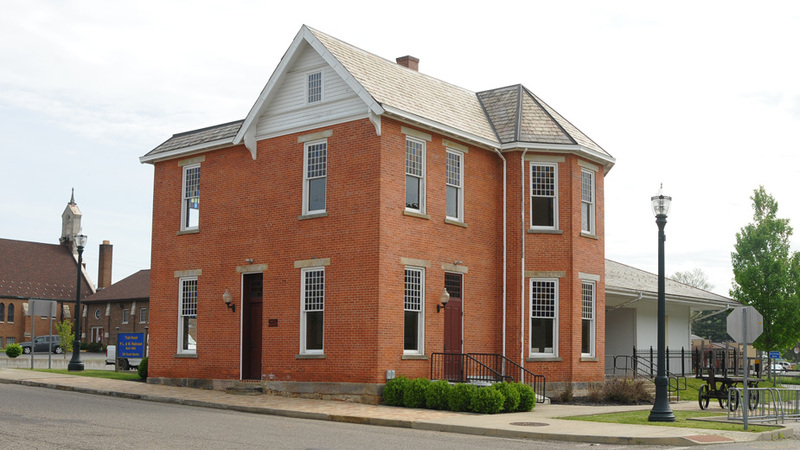 LISBON, Ohio – Joseph Morenz recalls walking through downtown Lisbon as a child and seeing business storefronts lined with goods in their windows. Revitalizing the downtown business district has been Morenz’s top priority since being elected mayor of Lisbon in 2015. Before taking office, Morenz says he saw many empty storefronts with no signs out front indicating they were for rent or sale. Of the 92 storefronts, he guesses a third stood empty. “We’re working on trying to get these buildings opened up so business can go into these places,” he says. 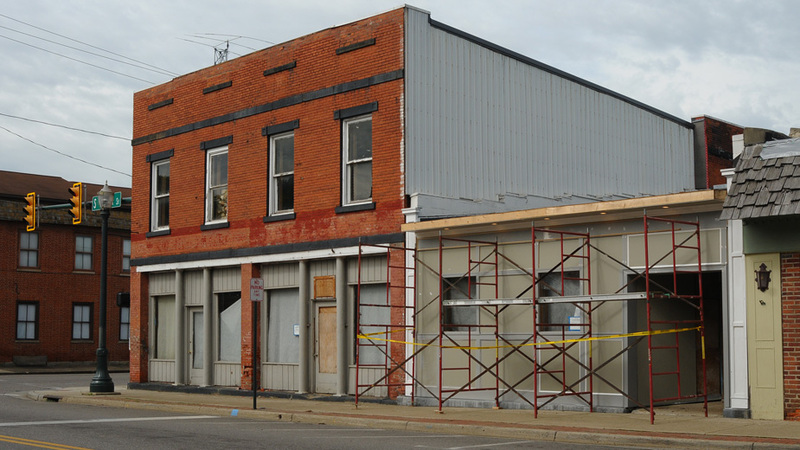 In addition to vacant buildings, he saw a lot of buildings that needed facade work, such as repainting. Last fall and again this spring, Morenz sent letters to the owners of these buildings, asking them to make an effort to find a tenant or a buyer if their building was empty, or to fix their building if it weren’t up to code. Should the owner fail to make an effort, he will be fined a $200 annual inspection fee, which doubles each year the building remains vacant until it maxes out at $3,200 in five years. The village is the government seat of Columbiana County, which the mayor believes helps businesses because people from around the county visit the courthouse downtown. Some people stop by a restaurant to grab something to eat or visit a store after going to the courthouse. Lisbon’s population is just under 2,700, based on the most recent U.S. Census Bureau estimate in 2016. Many of the businesses in Lisbon are well established, Morenz says, and many are housed in buildings more than 200 years old. A few have been open more than a century. One business, Sandy & Beaver Insurance, opened in 1879. Jim Sanor, president of Sandy & Beaver, has been involved with the business for 33 years and over that time has seen the downtown business district go through changes. Pictured: Sandy & Beaver Insurance building was built in 1806. 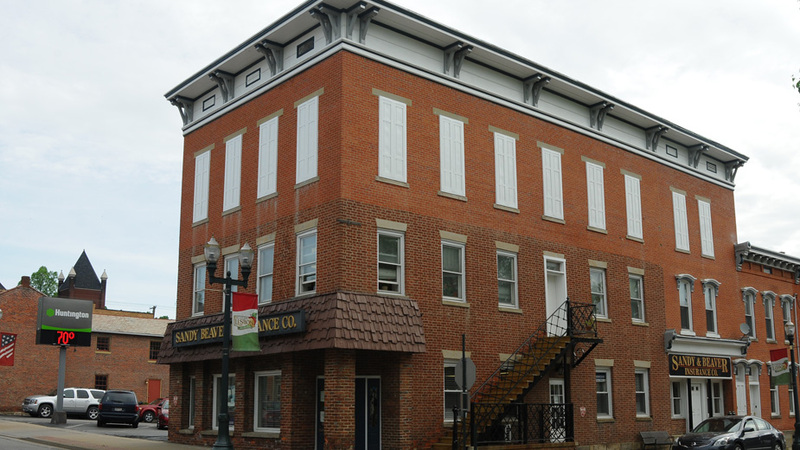 The building Sandy & Beaver is in, 108 N. Market St., was built in 1806, Sanor says. With it being more than 200 years old, along with many other buildings on Market Street, constant upkeep is needed. “Anytime you own an old building like I do, there’s perpetual renovation going on,” he says. One of the buildings across from Sandy & Beaver, 111-115 S. Market St., was the first building constructed on the street in 1805, says its owner Renee Lewis. Lewis bought the two-story brick building last fall for $10,400 after the previous owner wanted to demolish it. “It’s such an early building, I did not want it be torn down,” she says. Restoring the building has posed more problems than Lewis originally thought. Support beams are broken and the roof is caving in, which in turn is unsettling the bricks that hold the building together. Pictured: The building at 111-115 S. Market St. was built in 1805 and is slowly being restored. Lewis isn’t new to restoring old buildings in Lisbon. She spent 11 years and well over $1 million to convert the Hamilton Building, 116 W. Lincoln Way, built in 1803 into the Courthouse Inn & Restaurant, which opened in 2016. The mayor and Village Council have partnered with the Lisbon Area Chamber of Commerce in revitalization efforts over the past two years, which chamber President Susan Shank believes is the first time there’s been this type of partnership in the village. “As the Village Council tweaks [building] codes, we are making sure we understand how that’s going to affect anyone coming in and looking at opening a business,” she says. New businesses in the past year are a nail salon, yoga studio and a massage therapy salon. “There are things that are trendy today that we need to have available to the people that visit or live in Lisbon,” Shank says. The Lisbon Area Chamber of Commerce hosts quarterly events to bring people in from out of town as well as involve those who live in Lisbon. In February, the chamber held a “Wine about Winter” wine tour, where vintners from the area set up shop inside businesses downtown. This enabled people on the wine tour to visit these businesses and sample the wines. As many as 18 bus tours, seating 50 people each, stop in Lisbon each year, says Gene Krotky, director of the Lisbon Historical Society Museum. Most bus tours are from Pittsburgh, Cleveland and Akron. The history society holds a lunch or dinner for the tours at the P.L. & W. Train Station and then visitors can tour the Lisbon Historical Society Museum and shop at Bye & Bye Hardware Co. on Market Street. Pictured: The P.L. & W. Train Station was built in 1886. The building, now a tourist attraction, was restored in 2009 at a cost of $815,008. Other attractions that draw people from out of town are the bike trail and climbing cliffs. Little Beaver Creek Greenway Trail brings families from western Pennsylvania and the Canton and Cleveland areas, Shank says. The bike trail is part of the larger Great Ohio Lake to River Greenway, which extends 100 miles from Lake Erie in Ashtabula County, south through Lisbon, and ends near East Liverpool along the Ohio River. On May 19, the Ohio Climbers Coalition from Cleveland visited Lisbon to replace older bolts with newer ones used to climb the cliffs next to Logtown Road, northeast of downtown. A project expected to be complete in June is a dog park at the corner of Mill Street and Pritchard Avenue. A $25,000 grant from the Marjorie Hartman Family Foundation is being used to complete the park, which will be 250 feet long and 60 feet wide. Pictured at top: Susan Shank, president of the Lisbon chamber, is working with Mayor Joseph Morenz.